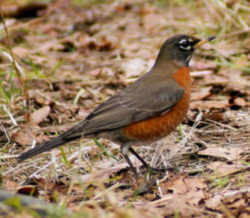 The Connecticut's Robin, a true thrush, is a migratory bird with a reddish brown or tawny breast and a loud cheery song. It was first called Robin by the early colonists, in remembrance of the beloved English bird. Despite the protests of some naturalists, we still retain that traditional name. The American robin, familiar in the summertime throughout North America, clad in a reddish brown or tawny breast and a loud cheery song, evident in the fact that it is also the state bird of Connecticut, Michigan, and Wisconsin. Familiar in the summertime throughout North America, the American Robin is seen from Alaska to Virginia. Most people do not know that many Robins spend the entire winter in New England. They roost among the evergreens in the swamps where they feed on winter berries. American robins occur mainly in woodlands, gardens, orchards, lawns, and fields. They search for food (forage) in areas of open ground or short grass. They nest and roost in the edges of woodland or scattered trees and shrubs. They need dense shrubs and small trees in which to build their nests. They build nests deep in dense foliage to protect their young from predators. Suburban and agricultural areas often provide these kinds of habitats so American robins are common near humans. 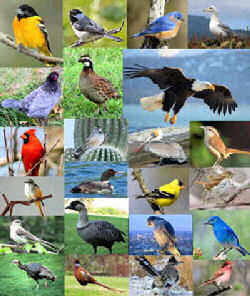 They migrate south for the winter, going as far as southern Mexico and Guatemala. 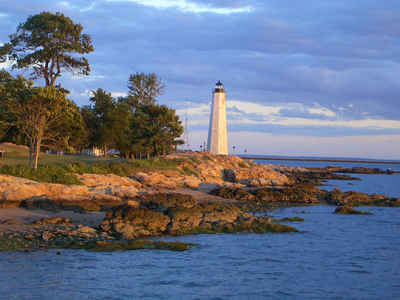 In summer they are found as far north as northernmost Canada and Alaska. American robins are the most abundant and widespread North American thrush. The main diet of the American Robin is berries. This is supplemented by insects, larva and worms. Males and females form a pair bond during breeding season and while raising their young. American robins breed in the spring shortly after returning from their winter range. The breeding season extends from April through July. American robins are one of the first birds to begin laying eggs each spring. They normally have two or three sets of young in each breeding season. A new nest is built for each sets of eggs. The female robin builds the cup-shaped nest. The outer foundation is made from long coarse grass, twigs, paper, and feathers woven together. She smears mud onto the inner bowl with her breast. She later lines the inner bowl with fine grass or other soft material. This lining helps cushion the eggs. The nest can be located on the ground or high up in trees. They are most commonly found 5 to 15 feet above ground. Robin's nests might be in a dense bush, in the crotch of trees, or on window ledges or other human structures. All of these provide a firm support and protection from rain. In northern areas the first nest is generally placed in an evergreen tree or shrub. The later nest are in a deciduous tree. The law designating the American robin as the official Connecticut state bird is Section 3-109 (State bird) of the Connecticut General Statutes Title 3 (STATE ELECTIVE OFFICERS) Chapter 33 (SECRETARY) Section 3-109. TITLE 3 - STATE ELECTIVE OFFICERS. Sec. 3-109. 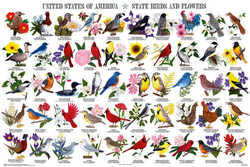 State bird. 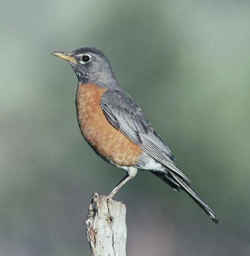 The American robin, Turdus migratorius, shall be the state bird.